In Act 1 of Macbeth, Lady Macbeth, sensing her husband’s shaky resolve in committing murder to secure the crown of Scotland, asks spirits to “unsex” her ‑ to take away the “weaknesses” associated with being female. Popular conceptions of contemporary theatre in Shakespeare’s time – think Shakespeare in Love, for example – are of an all-male domain following a strict gender binary of men’s roles and women’s roles. Lady Macbeth’s famous speech would have originally been performed by a “boy actress”: an adolescent male apprentice who would, as his voice changed and body matured, move into performing male roles. Women were completely absent from the stage in Shakespeare’s time – or were they? Two McMaster researchers – and an international team of scholars and actors – are working to show both the scholarly world and the theatre community that Shakespeare’s all-male stage isn’t the be-all and end-all of early modern theatre. In fact, England’s lack of professional female performers is a peculiar quirk in an otherwise far more diverse European theatre landscape: one that involves women playing women, women playing trans men, and women doing traditionally “male” things on stage, including acrobatics, swordplay and horseback riding. 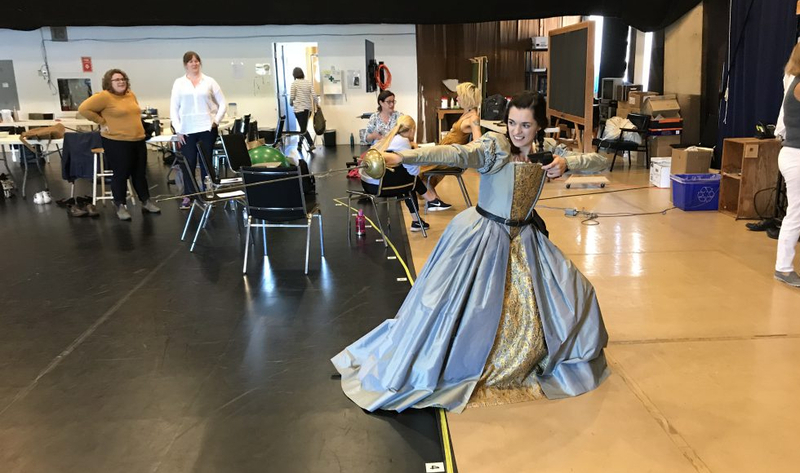 Gough and her colleague Peter Cockett, an assistant professor in the School of the Arts, have embarked on Engendering the Stage, an international project examining issues around the portrayal of gender in early modern theatre. The project involves collaboration between academics and professional theatre practitioners – including those from Ontario’s Stratford Festival — and combines traditional research in early theatre history with “Performance as Research,” which is a form of inquiry that uses the artistic process – the actual making of art – to inform research questions and outputs. Earlier this fall, Gough and Cockett began their work with five days of workshops in the Stratford Festival’s Laboratory, a platform for developing new plays and experimenting “with diverse approaches to staging the classics.” Held in conjunction with the department of English and Cultural Studies’ John Douglas Taylor Conference, the workshops brought together 15 scholars, 10 actors from the Stratford Festival’s 2018 company and four guest artists to stage scenes from four plays from the early seventeenth century, all of which featured “sword-wielding” female characters. For Keira Loughran, who organizes Stratford’s Laboratory, both academics and actors were able to learn from each other. Following the workshops at Stratford, Gough, Cockett and their colleagues returned to McMaster for a day of public presentations and discussions, culminating in an evening forum. Held in partnership with McMaster’s Socrates Project, the forum explored issues around non-traditional gendered casting with actors Seana McKenna and Martha Henry, both of whom were cast in traditionally male roles at Stratford this season – McKenna as Julius Caesar and Henry as Prospero. For Gough and Cockett, the complexities of the past inform the practice of the present, setting a precedent for creativity and openness when it comes to thinking about gender.